The first time a fan of The Mask discovers the prop mask used in the film they are in for a shock. While the film is in Black and White, the mask can only be described as made in Technicolor. 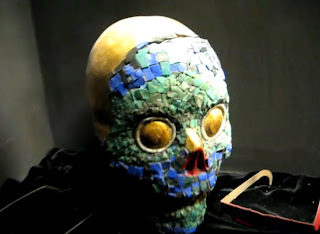 Brilliant green and blue mosaics cover the skull shaped design and I’ve been told that its teeth are real human teeth. 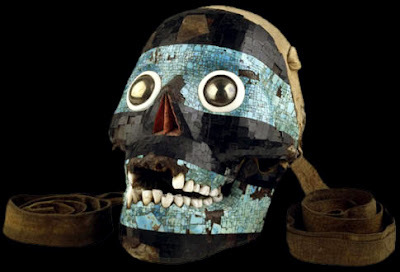 Perhaps the mask Roffman had used was this one (pictured below) from the British Museum, a mosaic tiled mask from Mexico. “The skull of the Smoking Mirror” is a mosaic mask created to represent the Aztec deity Tezcatlipoca, whose name translates into English as “the Smoking Mirror”. The mask uses a human skull as its base, with the back cut away and lined with leather so it can be worn. The leather also creates a hinge for the jawbone. The alternating bands of the mosaic are made of blue turquoise and black while the eyes are made of orbs of iron pyrite, encircled by a ring of white conch shell. This mask dates back to the 15th-16th century AD. Yes, the influence of the mask from the British Museum on the look of the one in the film seems pretty unmistakable. Great post!